The Wheeling Alternative - I'll ask again -- which side are you on, Intelligencer? I have argued (most recently here) that the Intelligencer is not pro-coal, it's pro-coal owner. Pro-coal would mean that you cared about coal miners as something more than troops in the "war on coal." Being pro-coal owner places emphasis on maximizing profits regardless of what happens to the workers. 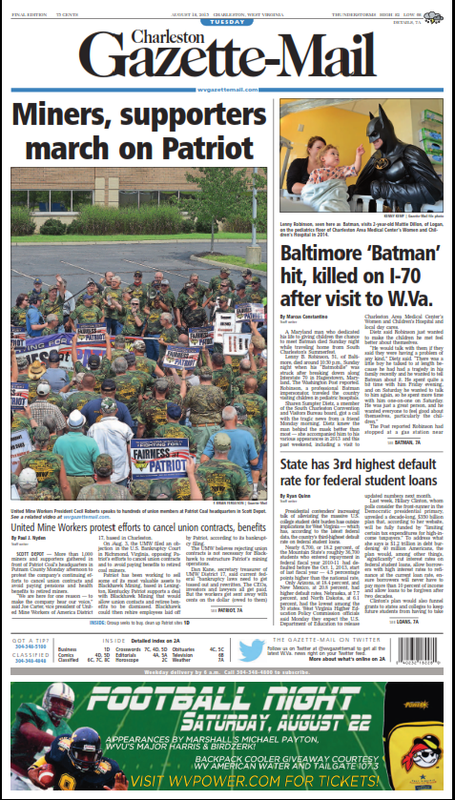 Here is a screen shot of the front page of today's Charleston Gazette with almost half of it devoted to coverage of yesterday's United Mine Workers' march at Patriot Coal's headquarters in Putnam County. More than 1,000 miners and supporters gathered in front of Patriot Coal’s headquarters in Putnam County Monday afternoon to protest the company’s continuing efforts to cancel union contracts and avoid paying pensions and health benefits to retired miners. “We are here for one reason — to make the company hear our voice,” said Joe Carter, vice president of United Mine Workers of America District 17, based in Charleston. On Aug. 3, the UMW filed an objection in the U.S. Bankruptcy Court in Richmond, Virginia, opposing Patriot’s efforts to cancel union contracts and to avoid paying benefits to retired coal miners.